20 miles this week! Overall I’m feeling ok. Not great. I am having a bit of trouble with my breathing. 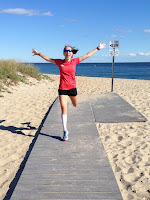 For awhile I was attributing it to the humidity and not running for a few weeks with my Achilles strain but Fall has arrived on Cape Cod and I’m still on the struggle bus. 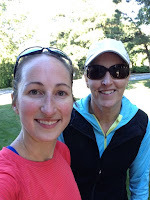 I skipped my own run on Monday and decided to take Georgie out for a quick run in between the bouts of rain. I was rushing and totally unprepared to run with Georgie, which lead to my worst nightmare… Georgie slipped out of her collar and got loose in the woods! She wasn’t wearing the right collar and stopped to sniff. I kept going. I pulled the collar right off her. At first she didn’t notice. I called her and started running to see if she would follow. She did but I stopped and that’s when she noticed she wasn’t attached to me anymore. She gave me the look, crouched down then went into her crazy sprint mode back and forth through a big mud puddle. I’m not sure how I got ahold of her but I was able to put her collar back on and we ran back home to BATH TIME. The worst. Our run on Friday was totally uneventful. Thank god. Then on Saturday I had company on my long run with Lindi Lou on the bike. I worked Saturday morning so we didn’t head out until late afternoon but it was BEAUTIFUL. The perfect fall day and the best time of year to be a runner on Cape Cod. 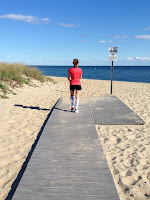 · 5 weeks until the Cape Cod Half! · 18 weeks until the Miami Marathon!